I’m very pleased to announce that Captain Lee R Mandel, MC, USN, has agreed to join the Board of Directors of the Foundation for the History of Navy Medicine. He takes the seat previously held by RADM Doug Moore, SC, USN, RET, a good friend–and lawyer–who helped us jump through the paperwork hoops to get the Foundation up and running. Lee is a real sea-going Medical Officer, recently returned from a tour aboard one of our aircraft carriers (memory fails me as to which one) and he now is the Command Medical Officer aboard the Navy Safety Center in Norfolk. He’s also an outstanding historian, and has given a paper at one of our annual panels. He will join a Board already noted for its distinguished members, RADM Fred Sanford, MC, USN, RET, and Professors Harry Langley and Annette Finley-Croswhite. The Board oversees the operations of the Foundation, the Mission of which is to support the work of the Society for the History of Navy Medicine. It is a 501(c)(3) public benefit charity. This year, thanks to your tax-deductible dues-donations and Life Memberships, we had the pleasure and honor to provide $750 Travel Grants to four graduate students giving papers at our panels at the Naval Academy History Symposium. The Board just this week approved a Grant to the Naval Historical Foundation to assist in acquiring the shipboard journal of Civil War Acting Assistant Surgeon Ezra Pray. Once this journal is digitized, it will be given to the Collection at the Historical Office at the Navy Bureau of Medicine and Surgery. Does anyone know the whereabouts of Society member Arnel de la Peña? Since he retired from the Navy, he has apparently fallen off the face of the known earth. I’ve made inquiry through all my semi-official Navy sources to no avail. So I call upon you. If you know CDR de la Peña’s contact information, please send it to me. We hate to lose touch with our members! The Naval Order of the United States, at its annual Congress in Galveston this past weekend elected me to be their “Surgeon General” for 2011-2013. The Order, established in 1890, is the oldest Navy-related society in the country. Its Mission is to promote the history of the Navy through research, study and publication. As Surgeon General, I will have the opportunity to write about the history of naval and maritime medicine in the Order’s quarterly publication, and at its meetings. Membership in the Order is by invitation or through inheritance. After perusing the Order’s website, if you are interested in becoming a Companion in the Order (or an Associate if you do not meet the requirements for Companionship) please contact me. Your correspondent is attending the annual Congress of the Naval Order of the United States in this historic city. This year’s Congress theme is World War II in the Gulf of Mexico. I didn’t know that Galveston is located on one of the coastal islands off the Texas mainland. It was and is a busy maritime port, founded by act of Mexican Congress in 1825. Our conference site is the 100 year old Hotel Galvez, named after the city’s namesake, the Spaniard Bernardo de Gálvez y Madrid, who served in several Spanish imperial roles in the area in the early and mid nineteenth century. Galveston was an important commercial port in the 19th century, and really came into its own as the Texas oil industry grew in the early 20th century. Because of the large sea-based oil commerce along the coast of the Gulf of Mexico, German naval authorities early in World War II targeted the region intensively with submarine activity. In the four months before the convoy system was reinstituted (from lessons learned in World War I) in the Gulf, innumerable ships carrying oil or refined oil products were sunk, with a loss of about 2000 lives. The number of ships sunk dropped precipitously thereafter, and German efforts in the Gulf were gradually abandoned. The Naval Order of the United States was founded on 4 July 1890, with a mission of promoting research, study and promulgation of naval and maritime history. The organization has Commanderies throughout the United States. Your correspondent is proud to report that he was elected to serve the organization as Surgeon General for the next two years. In this role, he has the opportunity to write something about naval medical history for the Order’s quarterly publication. If any of our readers are interested in joining the Order (which is by invitation), please let me know by leaving a comment. So it was with the Naval Cemetery on Mare Island in northern California. It actually antedates the first Naval Hospital on the west coast by about 20 years, having received its first burial in 1856. Navy medical care was delivered on a succession of receiving ships almost from the Mare Island Navy Yard’s founding–by then-Commander David Farragut in 1854–until the first land-based medical facility, a converted granary, opened for business in 1864. From the beginning, Medical Officers in Charge included regular cemetery status reports and funding requests in their correspondence with leadership back in Washington DC. The Cemetery officially closed in the 1920s, though the last burial actually took place in the latter part of the 20th century. The Naval Hospital closed in 1957, and the Navy Yard in 1997. 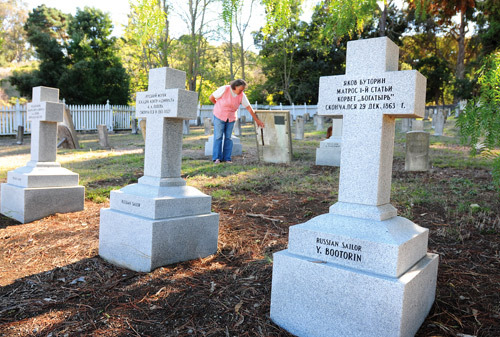 Management and maintenance of the Cemetery–now part of a National Historic Landmark District–fell to the City of Vallejo. About a year ago, 1890s-era marble VA grave markers labeled “Russian Sailor” which stood over three of the six (three earlier marble stones probably dating from the 1860s had been spirited off the island in the 1990s only to be returned last year) were quietly removed, and six larger, granite markers in the style of two 1904 Russian graves in another, later, part of the cemetery were substituted in their place. Vallejo City Ordnance requires that any such change to the historic district receive a Certificate of Appropriateness from the Architectural and Heritage Commission. This Certificate was never sought or granted. A small group of local historians and preservationists raised a hue and cry over the surreptitious nature of the swapout, the failure of those responsible to seek appropriate advice, and the fact that 1904-era markers were placed in an 1860s part of the Cemetery. The locals obtained outside expert opinions on the matter, and launched a letter-writing campaign both to the press and to the Architectural and Heritage Commission itself. That Commission, after several postponements, met last night. Despite a city staff recommendation for retroactive approval of the grave marker swapout, the seven Commissioners voted unanimously to deny it. Further, the seven voted to require repair or historically appropriate replacement of the stones originally guarding the graves. While this decision can–and likely will–be appealed to City Council, preservationists are elated over the Commission’s rejection of its own staff advice and adoption of their view on the matter. Your author is proud to have been part of the group advocating for repair and / or historically informed replacement of the earlier markers. Today is a “news day” at Of Ships and Surgeons. 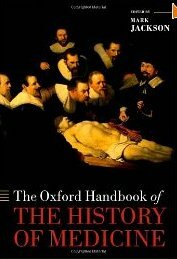 Perhaps you’ve already read of the 8 September UK release of The Oxford Handbook of the History of Medicine; it is scheduled for publication in the US on 1 November. The book’s available now at Amazon.com for $150. (If you purchase using the link, the Society will benefit with a small commission). A perusal of the Table of Contents reveals that the Handbook views medical history through three separate historical lenses. First is the traditional “Historical Periods” section, with chapters running from the Graeco-Roman World through the Enlightenment to Contemporary History. A little more modern perspective is reflected in the second section “Places and Traditions”. This looks at health care history from a regional standpoint reaching from China through Eastern Europe including Russia to Sub-Saharan Africa to New Zealand and Australia. Finally, in a thoroughly “new era” historical mode, “Themes and Methods” features chapters on such topics as Political Economy and Health Care, Health and Sexuality, and Medical Film and Television. Consider this: military / naval medicine does not make the cut, at least with a chapter title to call its own. As might be expected from an Oxford publication, the Handbook–edited by Professor Mark Jackson, Director of the Centre for Medical History at the UK’s University of Exeter–features authors mostly from UK institutions, though the occasional Canadian, New Zealander and American does appear in the list of contributors. Scholars putatively from Iranian and Indian traditions–faculty at UK institutions–also find their way into the book. Notable, I think, in this era of globalization, is the absence of contributors from Chinese, Arab, or Spanish/Latin American academia, given that these locales / traditions are represented by chapters in the book. I’ve not yet seen any reviews, but once published, I’ll try to remember to let you know. On another note, Professor Harry Langley writes to report that Society member William P McEvoy, a graduate student at the Kansas State University, has an article–Experiences at Sea: A Navy Doctor at War–published in the newest number of the Journal of Military History. That journal has not yet made it to these California shores, but once received, I hope to have Mac’s permission to highlight and possibly excerpt the article in a posting here. Congratulations to William McEvoy!